For most 8-year-olds, helping out a friend at lunchtime might involve sharing a snack or making a mutually beneficial trade. But when third-grader Cayden Taipalus realized some students at his school had to forgo hot meals because they had negative lunch account balances, he raised enough money to help thousands of his peers. “I just want to make kids have a better lunch,” he told TODAY.com. It all started two weeks ago, when Cayden came home upset from Challenger Elementary School in Howell, Mich. During lunchtime, his friend had been forced to give up his hot lunch for a cheese sandwich because the overdue balance on his lunch account hadn’t been paid off yet. “He wanted to know how he could help,” Cayden's mother Amber Melke-Peters told TODAY.com. Cayden and his mom came up with a plan to pay off the overdue lunch accounts at his school by returning empty bottles and cans and soliciting donations from friends, family and neighbors. Last Monday, he handed over the fruits of his labor: $64, which paid for around 150 lunches. That small gesture of kindness has since grown into a widespread effort. After a local radio station mentioned what Cayden had done, others expressed their desire to help, and he and his mom started an online campaign to collect donations. Hundreds of people from the U.S. and abroad have since pitched in to donate over $10,800 to his cause. 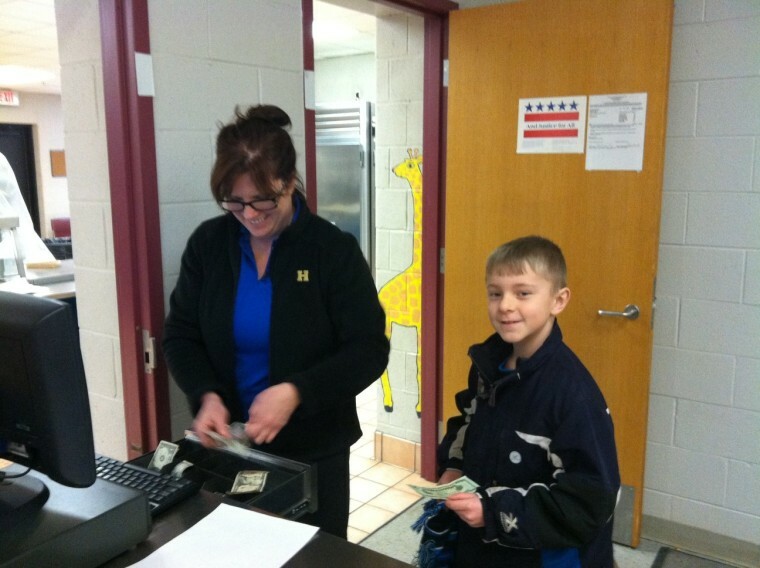 Mother and son returned to two other schools last week to pay off lunch accounts, and will visit three more this week to spend the funds they’ve collected so far on FundRazr. They plan on adding extra funds to each overdue account, ensuring those students can get hot lunches for days to come. The Howell school district's policy is to offer students an alternative lunch of sandwiches when their accounts reach a balance of negative $5. Thomas Gould, director of public relations for Howell Public Schools, praised Cayden for what he's done. Though younger than most, Cayden isn't the first to have this impulse. In early February, student mentor Kenny Thompson paid off the $465 balance on student lunch accounts at Valley Oaks Elementary School in Houston, inspiring hundreds of others to do the same. All the attention hasn’t fazed Cayden, who remains focused on raising enough money to help all the students in Livingston County. And how does Cayden feel about helping fellow students?